Apple, the world’s most valuable company, has always proudly trumpeted its California roots. But the most American of all tech companies has never been a fan of paying back into the system that facilitated its success. On Wednesday, it announced that now that the US government has sufficiently capitulated on corporate tax rates, it will pay a fraction of the taxes it previously would have owed. If Apple had paid the previous tax rate of 35 percent, its bill would have come out to around $88 billion. Now, that money can go into making the company even larger and providing more cash to hold overseas until Uncle Sam cries uncle again. President Trump was quick to thank himself for Apple’s announcement. 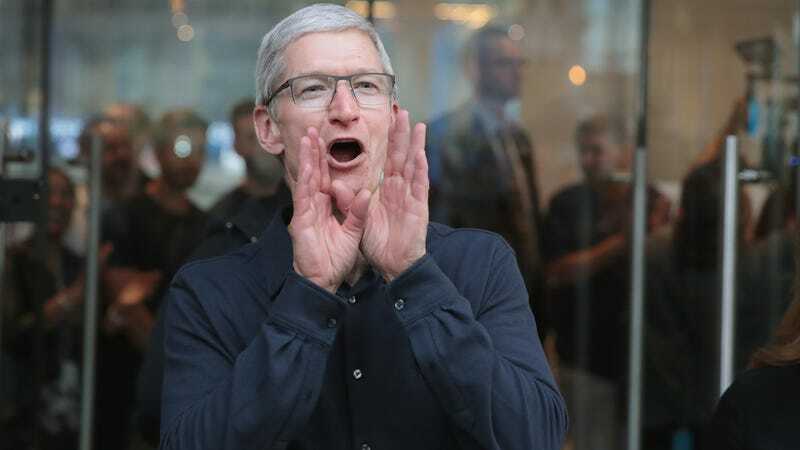 On Wednesday night he tweeted, “I promised that my policies would allow companies like Apple to bring massive amounts of money back to the United States. Great to see Apple follow through as a result of TAX CUTS. Huge win for American workers and the USA!” Yes, the master dealmaker gave Apple everything it asked for, and Apple followed through with doing what it wanted the whole time. When Trump brags about a corporations investment, it’s usually a good idea to see if that investment was planned before he ever took office. Just before he was sworn in, Trump claimed that he saved hundreds of jobs at an Indiana Carrier plant. The reality was that tax incentives gave Carrier some more cash to automate jobs, and hundreds of subsequent layoffs have ensued. Other shady investment victories Trump has touted have involved Alibaba and Foxconn. Apple is known for its secrecy and doesn’t do a lot of pre-announcing. Gizmodo has reached out to Apple to ask if the plans for a new campus and hiring were already underway before the tax cut late last year. We’ll update this post when we receive a reply. It does seem that the one-time tax deal will accomplish its goal of bringing back overseas money without inconveniencing corporations. The Wall Street Journal estimated that Microsoft could pay around $11.7 billion, Cisco $6.2 billion, IBM $6.1 billion, and Google parent Alphabet $5.2 billion. All-in-all, research firm Audit Analytics estimated that $2.8 trillion is being held by corporations overseas. The decision for the US government to forego millions should encourage some of that to come home. Conservatives will say this had to be done and the proof is in the pudding, but the fact is the EU and UK have both recently hit Apple with bills for unpaid taxes, and the US government likely could have found a way to get paid a little more of what it was owed. Look at the bright side: We’ll all get to see Apple become a trillion dollar company. Inspiring.